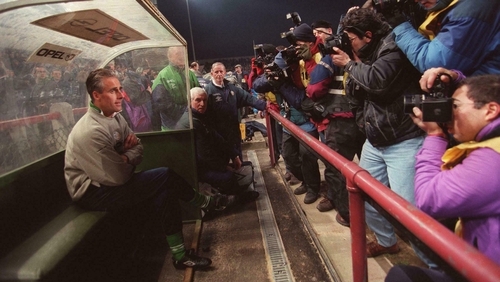 As Mick McCarthy prepares for his second spell in charge of the Republic of Ireland we look back on his first game as Ireland manager, a 2-0 defeat to Russia on 27 March 1996, and catch up on what those players are doing today. The Donegal man was a mainstay of the Ireland squad for close to two decades and it was Mick McCarthy who gave Given his first cap in what was the manager’s first game in charge. Given would go on to make 124 appearances for Ireland before eventually calling time on his career as he has since moved into coaching. As Derby County’s head goalkeeping coach, Given is working alongside manager Frank Lampard and has become a crucial part of the Rams’ backroom staff as they continue their push for Premier League football next season. Kernaghan’s international career was drawing to a close when McCarthy took the reins at Ireland, but he would still go on to play club football until 2006, exploring the lower reaches of the Scottish leagues as a player and a manager. When the defender finally hung up his boots, he had already led Clyde to promotion as a player/manager as well as working as player/assistant coach for Livingston and Falkirk. Kernaghan’s last managerial role lasted under a year after he resigned as Glentoran boss in the wake of a shock League Cup defeat to Annagh United. One of the best full-backs to ever wear the Ireland jersey, Staunton is unfortunately remembered more for his failed Irish managerial spell than his playing career. ‘The Gaffer’ was thrown into the deep-end after replacing Brian Kerr as Ireland manager in 2006 and after failing to qualify for the European Championships was replaced by Giovanni Trapattoni. Staunton went on to take up an assistant managerial at Leeds before returning to management at Darlington without any success. He then worked for Middlesbrough and Sunderland as a scout. More recently he has focused on his charitable work with the Stephen Staunton Foundation, which raises funds for among other Our Lady's Children's Hospital Crumlin and the Teenage Cancer Trust. Always in the discussion when it comes to best ever Irish players and surely a certainty for the best defender, McGrath has fought some well publicised battles with addiction since his retirement from soccer. His unflinchingly honest account of his career and the problems which blighted him throughout his life, Back from the Brink, won a host of awards, including Irish Sport Book of the Year. McGrath has written a weekly column with the Sunday World and he continues to work with charities Acquired Brain Injury Foundation and the Cystic Fibrosis Foundation of Ireland. The much-travelled defender played for a host of top flight clubs in England, from Leeds to Manchester City to Everton, but his coaching career has taken him even further afield. Capped 42 times for Ireland, Phelan moved to India after retirement when he Technical Director of Kerala Blasters' grassroots programme, before temporarily taking charge of their first team in 2015. Phelan returned to his previous role when Steve Coppell was named as the Kerala head coach and now days he’s the Technical Director of the Muthoot Pappachan Football Academy, helping prepare teenage players for a professional career. The 51-year-old is also a pundit for Champions League football on Indian television. High profile as a player Keane hasn’t exactly been out of the public spotlight since calling time on his playing career. The former Manchester United midfielder has managed Sunderland and Ipswich Town to varying degrees of success while he spent the last five years as Martin O’Neill’s assistant manager for Ireland. Keane helped to steer Ireland to Euro 2016 before both he and O’Neill parted ways with the FAI last November following a string of disappointing results. The two have since reunited at Nottingham Forest. Scorer of perhaps the most famous goal of the first McCarthy era, in the 1-0 victory over the Netherlands at Lansdowne Road in 2001, McAteer continues to represent Ireland today, often lining out for their Soccer Sixes side. The former Liverpool player is also heavily involved with the Liverpool Legends team and will play for both Liverpool and Ireland in the up-coming Sean Cox Charity Match at the Aviva Stadium. Off the pitch, McAteer works as a pundit for beIN Sports, as well as Liverpool’s in-house production LFCTV. With 70 caps for Ireland and a place in the FAI Hall of Fame, Andy Townsend made an easy transition from playing soccer to talking about it. Never really showing any inclination to go into management, Townsend has been a commentator and a pundit since retiring from playing in 2000 and famously gave the world Townsend’s Tactics Truck in ITV’s thankfully short-lived The Premiership. These days he works as a co-commentator for BT Sport as well as providing commentary for the FIFA line of videogames. These days the former Liverpool winger is more likely to be doing the dropping as he’s moved into coaching following his retirement from playing. The Dubliner spent a couple of seasons managing Ipswich’s Under-21 side before taking up a roll with the Manchester City academy and is currently working alongside Macclesfield manager Sol Campbell as the Silkmen’s first-team coach. As is almost mandatory of former Liverpool players, Aldridge is heavily involved in media work. The mercurial striker finished his playing days with Tranmere Rovers before taking charge of the club as player-manager, however, following their relegation from League One in 2001 he stepped down and moved away from management. ‘Aldo’ now works as a co-commentator on Liverpool’s Radio City station and writes a column for the Sunday World but surely his crowning achievement was winning RTÉ's Charity You're A Star in 2006, singing Ring of Fire and Lily the Pink in the final. Quinn has been a very busy man since his retirement as a player at Sunderland in 2003. He took a brief coaching role at Sunderland after retiring before moving into television punditry and commentary. Quinn returned to Sunderland in 2006 when he headed up a consortium that bought the club and named the former striker as the club’s chairman and manager. Quinn stepped aside as manager to appoint Roy Keane but remained as chairman until 2011. He now works for Sky Sports as a commentator and has most recently lent his support to breakaway League of Ireland group which plans to put together a proposal for a revamped league within the next six months.